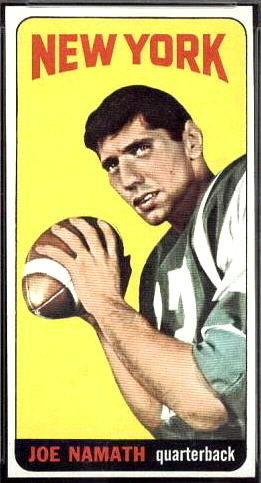 Despite appearing in just three full games as a senior due to torn ligaments in his right knee that required surgery, Namath was a highly-sought player coming out of college. He passed for 2713 yards and 24 touchdowns under Head Coach Paul “Bear” Bryant at Alabama and was chosen by both the NFL Cardinals and AFL Jets in the first round of their respective 1965 drafts. Namath signed a then-huge $427,000 contract with New York. Head Coach Weeb Ewbank announced that lightly-experienced veteran Mike Taliaferro would start the season at quarterback, but Namath saw his first action in Week 2 and, for the most part, moved into the lineup thereafter. Jets went 5-8-1 to finish second in the AFL Eastern Division. Knee and mobility issues would be significant throughout Namath’s career, but he had a quick release and strong arm. He was also charismatic (he quickly became a celebrity off the field) and a good leader. Namath led the league in pass attempts and completions, yards, and TD passes in 1966 and ’67 – in the latter season, he became the first 4000-yard passer in NFL/AFL history (4007). Prone to trying to force passes into coverage, however, he also led the AFL in passes intercepted in both years. In 1968, Namath had lesser numbers but more success and received Player of the Year honors as the Jets won not only the AFL Championship but defeated the NFL Champion Colts in a huge Super Bowl upset. He passed for 2734 yards and 19 TDs as the Jets again topped the Eastern Division in 1969, but a broken wrist that sidelined him five games into the ’70 season became the first of a series of injuries that dogged the remainder of his career. After appearing in just nine games in 1970 and ’71, he came back in 1972 to lead the NFL in passing yards (2816), TD passes (19), and yards per attempt (8.7) and was named to the Pro Bowl. However, a separated shoulder limited him to six games in 1973 and, with the team deteriorating around him, he had only sporadic success while leading the league in interceptions in 1974 and ’75. Namath finished his career with the Rams in 1977 and ended up throwing for 27,663 yards with 173 TDs and 220 interceptions. His #12 was retired by the Jets and he was inducted into the Pro Football Hall of Fame, Class of 1985.